The omen-bird wounds men who seek it. It was observed that to ‘converse with the birds’ stimulated eidetic experience, and was said to elucidate an intimate knowledge of angels. Through exposure to pain, the supplicant would access a convulsion of the mortal and avian, manifesting in a conjoined vision. Holography, or the possession of one’s own handwriting, in the Latin context, was heightened through an annotation of avian scarification. These cicatrices were ‘read’ as angelic text, imprinted on the damaged skin of any individual who had managed to communicate with the birds, thereby experiencing a momentary amalgamation of the avian, angel and human. Later, those known as ‘Avis Vulnus Homo’ suffered great persecution, most commonly tortured to death by immolation. The residual ash from such executions was rumoured to become ‘wan misshapen’; strange configurations lied by the wind, to acquire a reputation as ‘fowl air’. A hymn, or libation, in a hybrid of early Scots, aristocratic Gaelic and fourth century Shetlandic, originally embodied the Hebridean ritual concept of ‘Fear Eun Lota’. It was to be chanted whilst modulating the voice to a vessel, bole or other receptacle as it was slowly filled with water or wine, thus altering the pitch. This hybrid of language is considered unique among early Scottish invocations and scarcely evidenced elsewhere. In 1952, little-known Shetlandic poet, Kristján Norway, responded to such obscure historicity with a poem whose title, ‘Fear Eun Lota’, mirrors the myth’s Gaelic origins but whose Shetlandic and Scots tongues are construed via an introspective, Modernist interpretation. Norway is perhaps best remembered for having coined the term ‘Cantian Poetry’, due to a longstanding preoccupation with secrecy in language and abstruse systems of poetic codification. This is the only example in Norway’s output of a lunar motif, the poet having been more conversant with solar imagery, which perhaps reflects his ongoing fascination at the time of writing with ‘parhelia’, or ‘mock suns’ – hence the quadruple repetition of variants ‘mön, muin, moon’. Norway was to die in a fire in his broch later that year and this verse appears here for the first time in print, rescued from his papers. Arguably, the condition of the poem itself can perhaps be seen to manifest a wounded palimpsest of Scottish translation rites and rituals. foondit th’ glyphs i’ th’ girse, schauchie aff holograph. found the glyphs in the grass, discarded as writing. scliff [sklɪf, S. sklɛf, skløf, MN. sklʌuf, SN. skluf] n. A shuffling trailing way of walking or the noise made by that. A dull heavy tread. A clumsy or worn out shoe used as a slipper. A blow with a flat surface. A scuffing glancing blow. A thin slice. A shaving or paring. A segment of the moon or of an orange. broch [brɔx, brʌx] n. A halo round the sun or moon, usually the latter, indicating bad weather, any kind of circle or halo. holograph [ˈholəgraf] n. A holograph. A letter or other document wholly in the handwriting of one person. adj. Holograph, wholly in the writing of one person. Figs. a) From the Gaelic, b) Latin, and c) modern English. 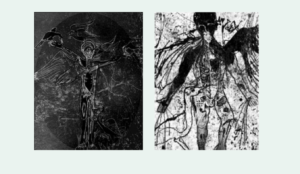 These are contemporary depictions; the Latin invocation of the ‘Homo Avis Vulneris’ was subsequently evolved in zodiacal sigil work, of which there are few remaining examples. It is regrettable that the earliest Gaelic artistic depictions of the ‘Fear Eun Lota’ have been lost. Equally, there are no surviving iconographic diptychs and we only know of one statue which was destroyed in a fire caused by King Edward II’s troops that ravaged Melrose Abbey in 1322. There remains in existence a single calligraphic transcription aributed to hagiographer Adamnán of Iona, and a contested reference in a Roman graffito on a preserved section of Hadrian’s Wall, now held in the special collections of the Hunterian Museum, Glasgow. Art historians can only presume that such graphic and three dimensional works were inculcated with an imagined impression of form, as opposed to eyewitnessed depiction, though scholars still debate this point. Typically, the association of transformative pain alludes to the potential in humans for achieving angelic flight or, metaphorically speaking, sacred flights of thought, though this was a Christianised position promoted by the early monasticism of St. Columba. As such, these extant relics merely retain an inference of any original pagan ceremonial significance. Nonetheless, in some circles it is understood that the ritual practice of summoning ‘Fear Eun Lota’ never truly died out, but is still evoked (outside the precincts of ‘Crown and Kirk’) on Shetland, at Dunlichity and purportedly, in Edinburgh’s infamous Underground City where several breeds of bird are said to be trained on raw meats in the dark.